Mutated RAS genes are some of the most common genetic drivers of cancer, especially in aggressive cancers like pancreatic cancer and lung cancer, but no medicines that target RAS are available, despite decades of effort. Researchers at the University of Texas (UT) Southwestern’s Simmons Cancer Center have now shown that RAS proteins act in pairs, known as dimers, to cause cancer, and these new findings could help guide them to a treatment. “RAS mutations are one of the most common causes of cancer and there are no options for attacking them. The dimerization activity of RAS gives us a solid lead for moving forward,” said Dr. Kenneth Westover, Assistant Professor of Radiation Oncology and Biochemistry with the Harold C. Simmons Comprehensive Cancer Center at UT Southwestern Medical Center, which is recognizing its 75th anniversary this year. 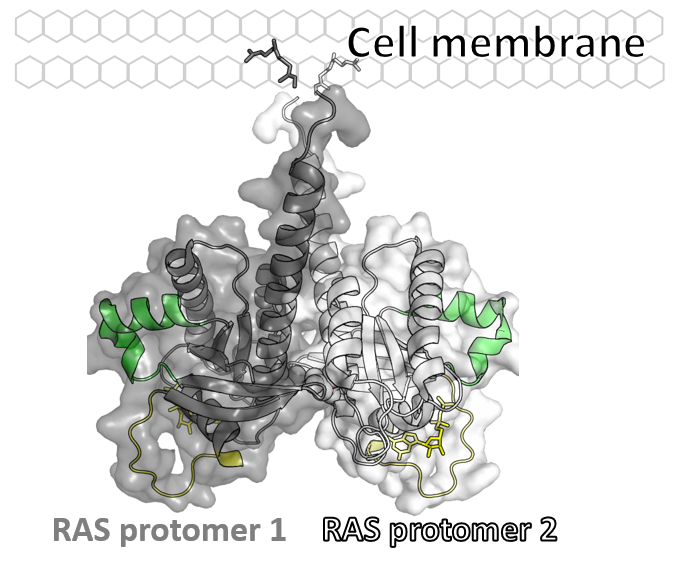 The question of RAS dimerization has been hotly debated, he said, but researchers previously have not been able to prove what RAS dimers look like, limiting the ability to design experiments that assess their importance in normal physiology and cancer. The UT Southwestern team led by Dr. Westover used X-ray crystallography data to predict what a RAS dimer might look like, then tested the model in cells using a method called fluorescence resonance energy transfer (FRET) to show when RAS forms dimers and when it does not. The new study, published online on January 11, 2017 in Cell, provides a foundation for further studies that delve into RAS biology and could potentially pave the way to develop new cancer drugs that target RAS dimerization. The article is titled “KRAS Dimerization Impacts MEK Inhibitor Sensitivity and Oncogenic Activity of Mutant KRAS.” “The primary function of RAS is to transmit signals that tell a cell to grow and divide, a pathway commonly hijacked in cancer.